Château du Fraissinet is a pretty country house tucked into a valley on the edge of the wild, mountainous Cevennes National Park. Bordered by the river Gardon, the stunning six acre grounds have lots of quiet corners to explore. Read in the shade of the hundred-year-old chestnut and plane trees, salute the sun on the Garden Terrace or take a cushion to the river bank and meditate on the myriad tiny fishes and the play of sunlight on the water. The Château du Fraissinet is the perfect place to practise asanas and let the stillness of yoga and the peace of this beautiful place permeate to the very core of your being. 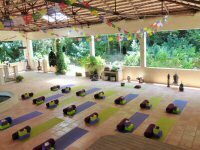 or in the dedicated yoga studio with lots of natural light. Guests can choose either a twin-bed room or a single. Showers and wc are shared between two bedrooms (one for every two rooms) . Accommodation is full-board and includes three delicious vegetarian meals daily. Organic wine may be purchased from our cellar. 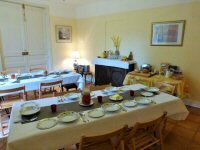 Tea and coffee are always available and facilities for making your own are available in the gites. By Train - to Avignon (1hr30mins), or Nimes www.thetrainline.com gives information on tickets in France. La Grand-Combe la Pise is the closest station - Chris and Alison are happy to collect guests free of charge from here. You can take a train from Ashford to La Grand Combe La Pise, this takes seven and a half hours and costs approximately £200.